Greene's Tu quoque, OR, The Cittie Gallant. As it hath beene diuers times acted by the Queenes Maiesties Seruants. Printed at London for Iohn Trundle. 1614. 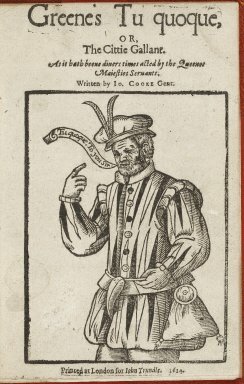 Title page imaged from Folger call number: STC 5673. Image is not from the transcribed copy.